Three paintings by the American Modernist Georgia O’Keeffe which have been deaccessioned by the Georgia O’Keeffe Museum in Santa Fe, New Mexico, will come to auction at Sotheby’s in New York this November. And, surprisingly, while two of them, A Street (1926) and Calla Lillies on Red (pictured) (1928), will be in the contemporary art evening sale on 14 November, the third, Cottonwood Tree in Spring (1943), will be included in Sotheby’s American art auction on 16 November. None of the works are, as yet, guaranteed. 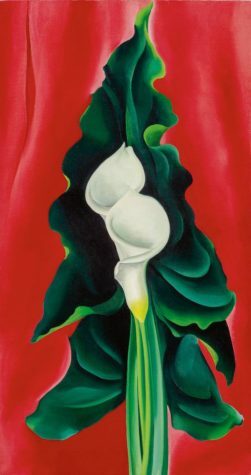 The Georgia O’Keeffe Museum also deaccessioned Jimson Weed/White Flower No. 1 (1936), which made headlines when it set a record for any work by a female artist, selling at Sotheby’s in May 2014 for $44.4m—triple its high estimate.